Scale is the product of oxidation which takes place during hot rolling. The oxidation and scale formation of steel is an unavoidable phenomenon during the process of hot rolling which involve reheating of steel in a reheating furnace, multi-pass hot rolling and air-cooling in the inter-pass delay times and after rolling. Scale formed during the heating of steel to rolling temperatures in the reheating furnace is known as primary scale. This primary scale is removed before hot rolling. It is usually done for producing steel products with high surface quality and for reducing roll wear. However, secondary scale continues to form on the descaled steel surface during the inter-pass delay time in the roughing and intermediate rolling mills. The colour of primary mill scale is generally bluish black while that of the secondary scale is blue. The secondary scale gives the steel an appearance which is similar to that of a lacquer coating finish and is often mistaken for a blue coloured primer. The primary scale is composed of three well defined layers of iron oxides. Adjacent to the steel is the thickest layer consisting of wustite having an approximate composition of FeO. The intermediate layer consists of magnetite (Fe3O4) while the outermost layer is hematite (Fe2O3). The thicknesses of these layers depend on several factors linked to the rolling of the steel and the availability of oxygen at the steel surface. The layer at the surface of the steel is richest in oxygen and constitutes 0.5 % to 2 % of scale thickness. The layer at the metal surface is richest in iron and constitutes about 85 % of the scale thickness. The intermediate layer of scale constitutes around 13 % to 14.5 % of scale thickness. If scale is a uniformly well-adhered covering to the steel, then it can make an ideal protective barrier. Unfortunately, scale is not uniform, nor it is well-adhered. Scale is less reactive (more ‘noble’) than the steel underneath, and consistent with the behaviour of two dissimilar metals when in contact. Steel underneath being more reactive metal oxidizes (rust) at the expense of scale being less reactive. The scale can ‘pop off’ the surface, cracking the coating and allowing moisture to penetrate. This allows a galvanic reaction to occur which results in pitting corrosion (rust) to the base steel. Scale is a nuisance when the steel is to be processed. It needs cleaning before steel is cold worked. Further, any coating applied over the steel is wasted, since it comes off with the scale as moisture laden air gets under it. It is essential to remove all the scale to present a uniform and clean surface of the substrate steel for any further working or the application of any coating on the steel. Removal of scale is virtually impossible by hand. It is extremely tedious and time consuming using power tool cleaning methods. Neither of these two methods gives a good base to start. Several types of descaling processes are used for removal of scale from the surface of the hot rolled steels. These descaling processes are usually classified into four categories. These are (i) flame cleaning process, (ii) mechanical descaling processes, (iii) hydraulic descaling process, and (iv) chemical descaling processes. In this article mechanical descaling processes are described. 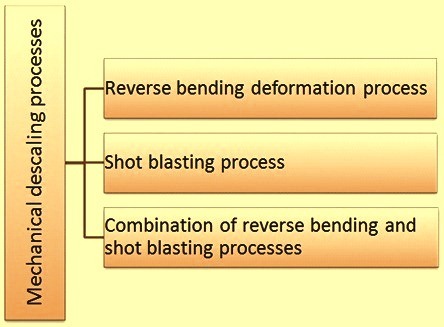 Mechanical descaling processes (Fig 1) normally include processing by (i) reverse bending deformation, (ii) shot-blasting, and (iii) combination of reverse bending and shot blasting. These processes are normally used for the removal of scale from the steel rods in the steel rod drawing industry. The reverse bending deformation process is based on the principle that steel rod is ductile and the hot rolled scale is brittle. When the rod is deformed, the steel bends, but the hot rolled scale breaks and is released from the surface of the rod and fall away provided the scale is there in sufficient quantity and there is sufficient deformation. The deformation mode is principally bending, but can also include stretching deformation. The equipment for the reverse bending deformation process is to use the principle of reverse bending in a controlled manner to achieve consistent results of scale removal without unduly affecting the properties of the steel rod being descaled. One of the important factors affecting the descaling process is the amount of total deformation of the steel rod. It is generally considered that the optimum amount of rod deformation necessary for the complete scale breaking ranges from 8 % to 10 %. Less than 8 % can result in incomplete scale breaking, leaving patches of adherent scale, and more than 10 % usually does not accomplish any additional scale breaking, while at the same time adding an undesirable amount of work hardening to the steel. An additional undesirable effect of heavy deformation (higher than 10 %) is the increased back tension on the rod line which can stretch and neck down the steel rod, affecting rod drafting schedules and requiring more power from the first block to pull the rod through the descaling system. The objective of 8 % to 10 % deformation is controlled by the relationship between the size of the sheaves used to do the reverse bending and the size of the steel rod being processed. The issue of rod stretching is also an important consideration. Elastic stretching can add to the effectiveness of the descaling process while excessive plastic stretching can have similar undesirable affects. The reverse bending deformation process equipment, although outwardly appearing as a very simple, straightforward piece of equipment, actually has very concrete design parameters which are required to be satisfied in order to have balanced descaling performance where the scale is broken off while not resulting in undue side effects on the steel rod. Proper equipment design in accordance with the basic principles of the scale breaking process is one key factor in accomplishing successful descaling of the steel. A properly designed reverse bending deformation process equipment breaks loose essentially all of the hot rolled scale. In doing so, 80 % to 90 % of the coarse scale falls from the rod and collects in the scale breaker. The balance 10 % to 20 % of scale, although loose, continues to stick to the surface of the steel rod. This is a fine, powdery remainder scale which is held on the surface of the rod by electrostatic charge. If not removed, this scale cause problems such as contaminated lube boxes, reduced die life, rapid draw block wear, poor quality of the drawn rod and an overall reduction in productivity of the drawing unit. It has been recognized very early during the development of the reverse bending process that there are undesirable results of leaving fine scale residues on the descaled rod surface. Initial attempts to remove this were fairly crude, including such methods as tying wiping rags on the rod line, or looping heavy hemp rope over the rod which can hardly be termed as production processes. One more method often used was employing of brushes to brush the fine scale residues. In recent times, fine scale removal equipments have been developed for the removal of the fine scale residues from the descaled rod surface. These equipments work on several concepts. One concept often used for cleaning the surface of the rod is with high velocity air jets while the other concept uses a water wash/air dry-on-the-fly approach. Equipments based on both the concepts not only remove the scale residue but also, essentially, contain it, so fine scale does not spread in the work area. This also helps in its easier subsequent disposal. The key objectives of the fine scale removal equipment for the non-aggressive cleaning of scale residues from descaled rods include (i) to remove the residue using industrial techniques, (ii) to contain the removed material, (iii) to have minimum of the operator attention, (iv) to have minimum of running maintenance, and (v) to have low cost of operation. Shot blasting process (also sometimes called abrasive blasting process) for descaling of steel is a surface treatment process in which cleaning of the surface of steel is carried out by forceful direction of an abrasive media applied either in dry state or suspended in a liquid medium, against the surface of the steel. The abrasive particles are concentrated at high speed (50 m/second to 110 m/second) in a controlled manner at the steel material. The abrasive impact of the abrasive particles removes the scale and other surface contaminants. The process of abrasive blasting began in 1904. It is the most used process these days for the surface descaling of the steel rods in the steel rod drawing units. It is an economical process and is a faster process than the pickling process of descaling. The abrasive media or substantial portion of it can be recycled for further use. With the shot blasting process, it is possible to obtain very good cleaning and surface preparation of the steel rod. This process for descaling is normally used for (i) the cleaning of the surface of the iron and steel castings and forgings, (ii) mechanical cleaning of sheets, rods, coils, and wire of steel, (iii) shot peening to alter mechanical properties (increasing resistance to fatigue for springs, and gears etc. ), and (iv) preparing surfaces of steel objects to be painted or coated. Shot blasting process for steel descaling is a common method for descaling during the production of bright bars. Cleaning of the surface by shot blasting is used in almost every industry that uses steel such as automotive, construction, foundry, forging, shipbuilding, rail, and many others. In the shot blasting descaling process, the methods of applying abrasive materials can be segregated into two distinct types of procedures namely (i) dry methods, and (ii) wet methods. Dry methods for the application of the abrasive materials include (i) mechanical blasting method, and (ii) air pressure blasting method. Mechanical blasting most often employs the use of cabinet type equipment. It is available in either batch, semi-automatic or automatic versions. Typically, the cabinet houses one or more blast wheels which direct the abrasive at the steel surface by centrifugal force. The wheel is positioned to ensure maximum coverage and high efficiency of the blast pattern on the steel surface. Clean abrasive, generally air washed and graded, is stored in a hopper. The abrasives flow from the hopper by gravity to a feed funnel and dipper valve which meters the abrasive flow to the impeller. The impeller imparts centrifugal velocity to the abrasive which is then directed through a control cage. The control cage determines the direction and shape of the delivery of the blast pattern on the steel surface. The wheel generally is enclosed in a protective housing to prevent discharge of stray abrasives. Because such machines are subject to considerable wear, especially the wheel components and machine interiors, the parts in many cases are made of a high alloy, wear resistant cast iron and are designed for easy replacement. Heavy rubber mats are often used on work tables to cushion the impact shock of the abrasive. Different types of wheels are available which permit greater efficiency of operation. In general, abrasive velocity (around 50 metres per second) and volume of abrasive media are such that mechanical systems provide a high level of work capacity per unit time. As a result, mechanical blast cabinet equipment can be geared to medium to high production applications. Air pressure blasting method uses compressed air to apply abrasive to a surface. There are three basic air pressure blasting methods namely (i) suction, (ii) gravity, and (iii) direct pressure. In the suction system, the compressed air is directed by an air jet into the nozzle to create a low pressure, high velocity air flow in the suction line leading to the gun. This line pneumatically conveys the abrasive from an abrasive collecting hopper to the blast gun, where it merges with the high velocity air streams. The spent abrasive drops into a collecting hopper where it is picked up by the suction line and recirculated through the blast gun. The gravity feed system uses an abrasive gun which is similar to the suction gun, but the abrasive is fed to the gun by gravity from an overhead hopper. This eliminates the less efficient pneumatic conveyance of the suction system and replaces it with a more efficient abrasive metering feed. The major problem of the gravity system in comparison with the suction system (and the reason for its infrequent use) is the requirement of an abrasive elevating system to return the spent abrasive from the collecting hopper to the gun feed hopper for recirculation. In the direct pressure system the abrasive is under pressure in a pressure vessel and is metered into the compressed air line to the blast nozzle. This system also requires some type of elevating system for abrasive recirculation. This is the most efficient system in terms the volume of air needed required per unit weight of abrasive moved and also produces the highest abrasive velocities and intensities. It is the only system which can move abrasive through long lances and side shooting nozzles to effectively descale the steel. Air pressure blasting method uses either a direct pressure or an induction method which can use either the siphon or gravity methods. These methods are described below. In the direct air pressure blasting method, the abrasive is fed from a pressurized container (pressure vessel) into a blast hose. The compressed air line is piped to both the blast hose and the upper portion of the pressure vessel. Since the air pressure (normally around 6 kg/sq cm) to both the hose and the pressure vessel is equal, it permits the free fall of the abrasive through an aperture (feed point) at the bottom of the pressure vessel. As the abrasive falls through, it is picked up by the compressed air and conveyed to the point of operation. In order to maintain air pressure, a valve is fitted at the filling point of the machine and held tightly closed by the air pressure. A metering valve is fitted at the feed point for the regulation of the abrasive flow at a rate suitable to the bore size of the nozzle and air pressure. In the case of the induction siphon method, the blast gun is connected to a compressed air pipe and a flexible hose which carries the abrasive. The abrasive hose is open to atmospheric air near the base of the machine hopper. As a result, the passage of compressed air through the gun and over the abrasive hose creates a partial vacuum in the hose which, in turn, draws or induces the abrasive into the gun where it is propelled through the nozzle by the jet of compressed air. The rubber abrasive feed hose is normally around 2 m to 2.5 m long between the hopper and the gun. The abrasive is accelerated by the air stream as it passes through the blast nozzle but does not reach the full velocity of the compressed air stream. The velocity of the abrasive leaving the nozzle is around 40 % of a direct pressure machine. Induction-siphon based equipments are used in a wide range of hand-operated abrasive blasting cabinets. Although they are used in continuous operation automatic equipment, their use are generally limited to the application of light abrasives. Induction-gravity based equipment is very similar to induction-siphon equipment in that a device is used to mix air and abrasive media. With induction-gravity equipment, however, the abrasive media is gravity fed from overhead storage. The air supply enters the gun at that point where abrasive is entrained under a partial vacuum plus the weight of gravity. Rapid expansion of the compressed air as it emerges from the gun gives final acceleration to the abrasive. Induction-gravity based systems are not in wide spread use. Although they can be applied for continuous operation, they usually are employed only for specialized applications. Mechanical dry blasting equipment is becoming increasingly more popular. Rapidity of the scale removal can be increased by increasing abrasive particle velocity and the quantity of abrasive inputs per unit of time. Installations can be made semi-automatic or fully-automatic with relatively little difficulty. Air pressure blasting is used when low production requirements or intermittent operations are anticipated. Wet methods for the application of the abrasive materials involve high velocity compressed air propulsion of slurry directed onto the steel. The slurry normally consists of fine abrasive suspended in chemically treated water. It usually is kept in continuous agitation to prevent settling of the abrasive. As with direct pressure dry blast units, compressed air is fed to the vessel containing the mixture at a pressure equal to that fed to the blast hose. Equalizing the pressure enables the abrasive mixture to feed through the mixing valve into the air line. The abrasive flow is controlled by a full flow valve which is situated between the hopper and mixing chamber. The equipments for the most of the wet abrasive blast methods are usually cabinet mounted and are often modified by auxiliary strippers, take-off conveyors, and wash-rinse dry stations. The basic designs include the vertical wheel, horizontal plane turntable, shuttle with rail or car extensions, chain or belt conveyors, self-contained turning mechanisms designed for shafts and tubular parts, and combination tumbling-cabinet machines. The slurry can be propelled against a surface by any of the following three distinct methods. By a stream of compressed air which raises the slurry through a siphoning action and then projects it through a suitably designed nozzle. By means of compressed air which propels a gravity-fed slurry to a gun. By use of a high-pressure centrifugal pump which produces the required speed of projection for the slurry. There are several variations of wet abrasive blast methods for specialty processes. Some of these processes have resulted in new process names although these processes can be categorized under wet abrasive blast methods. All the wet abrasive blast methods can be classified in the following two types. Hydro-blast process – In this process sand is mixed with water and propelled by the water pressure. Vapour-blast process – In this process abrasive is suspended in a liquid projected at high velocity by a jet of compressed air. In this descaling process, both the methods of descaling namely reverse bending and shot blasting are used in series in the rod drawing line. Normally reverse bending method is used first followed by shot blasting method. A variety of different abrasive materials are in common use. Selection of a specific type depends primarily on economic, metallurgical and practical engineering factors. The common used abrasives are sand, steel shot, steel grit, aluminum, flint/garnet, glass beads, carbides, slag, and organic materials. Steel shots are spherical grains made of liquid steel through an atomization (granulation) process. These cast steel shots are available in different sizes and hardness. Generally steel shots are manufactured from steel scrap in an electric arc or induction furnace. Steel scrap is melted in the furnace then the liquid steel is atomized into shot by water jet. Steps in the manufacturing process for the steel shots are (i) melting of steel scrap, (ii) atomizing of liquid steel by high pressure water jet, (iii) drying of the shots, (iv) screening (separation of the SAE shot size from the oversized shot particles used for grit production), (v) spiraling (removal of the irregular shaped shot), (vi) quenching (for the production of superior particle integrity with minimal stress cracks), (vii) tempering, (viii) screening, and (ix) packaging. The shot particles in the state of largest diameter are split forming the angular steel grit and used as abrasives for shot blasting process. The steel shots are normally durable because of its low friability. The shots get tempered due to the impact of blasting. Its hardness increases over time, allowing the media to deliver consistent, repeatable performance over thousands of cycles. As produced, the steel shots generally have a Rockwell hardness of 40 HRC to 60HRC. Steel shots have extremely low breakdown rate with virtually no production of dust. These are used for heavy scouring and to produce very bright finishes since the steel shots deliver high-impact energy and fast cleaning rates. This abrasive material is selected according to the work to be performed, not only by the size of the particle which is mostly uniform in all of them, but also be the hardness in certain range. The particles are easily recycled as being able to be projected from 700 to 5000 times according to the diameter, type and hardness of the abrasive used.